For some reason this debut novel passed me by when it was published. 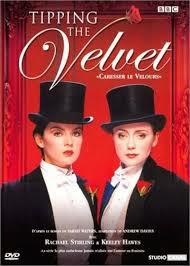 I knew about it and thought I knew what the phrase “Tipping the Velvet” referred to . If you don’t then read the book as I have come over surprisingly coy today!. (Although like many of the best titles it can be interpreted in different ways). I just never got round to reading it. When a television series was made of the novel in 2002 the tabloids had a field day. The Daily Mail, in particular, thought all those who watched it would suffer from incurable moral decline. I would have thought that this would have put it on the top of my viewing list but I didn’t watch it. It was a faithful adaptation with screenwriting by Andrew Davies , a writer who had been accused of “sexing” things up in the past. There was no need to do so with this as it was “sexed-up” already. It starred Keely Hawes and Rachael Stirling and it is available on DVD. I know that I put off watching it because I wanted to read the book first. I have now seen it and it’s a good interpretation of the Waters novel. Stirling (who comes across like a young Diana Rigg) is excellent in the main role. But it is the book that is an essential. I do love Sarah Waters and got into her work with her wonderfully Dickensian “Fingersmith” (2002) which is also an essential read and may very well feature in this blog in the future. I have now read all of her novels apart from her latest “The Paying Guest” (2014). Both “The Nightwatch”(2006) , set in the second world war and her tale of Victorian spiritualists “Affinity”(2009) are very strong novels. For me, “The Little Stranger” (2009), a gentle ghost story set in the 1940’s was a little too subdued and doesn’t rank amongst her best. Her best is this debut. Why does this opening paragraph have my mouth watering? I would no more eat an oyster, Whitstable or otherwise than do something else that I wouldn’t consider doing! It’s the skill of the writer who has drawn me in from her opening words. Nan is a girl who has grown up amongst the oysters in Victorian Kent, where her family runs a parlour serving the delicacy. It has been a life of chapped hands, little money and cramped conditions for Nan. Her life changes when she visits a music-hall and falls for a male impersonator. The glamour of show-business lures Nan in. A woman who is on stage pretending to be a man opens a whole can of worms (of oysters?) and Nan finds fame as Kitty’s performing partner when she gives male impersonation a try. 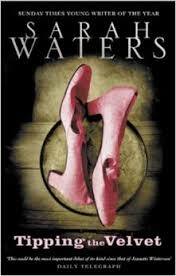 Although male impersonators (“mashers”) were a regular site in the Victorian Music Hall, Waters creates a whole lesbian underworld which may or may not have existed, but for the duration of this novel it is totally convincing and Waters’ London is every bit as real as Charles Dickens’. Like Dickens, and like Daniel Defoe whose “Moll Flanders” this book also slightly resembles Waters likes to keep the surprises and plot twists coming. In Dickens’ time it was to get you to purchase the next issue but here it makes for a riveting read. It is superbly written and hangs together well as a record of 1880’s-90’s London. This is some debut! Although I’ve read a book by an American President before (Barack Obama’s excellent “Dreams Of My Father”) I’ve never picked up anything by a British Prime Minister. This is despite both Disraeli and Churchill being considered good at this writing lark. So what did I choose for my first Prime Minister penned book, one by John Major, a minister I certainly never admired nor ever felt any affinity with- so his achievement in producing a book I really enjoyed is considerable. I saw this book sat on the shelves of the local public library and it was the subject matter that drew me to it- the English Music Hall. I actually didn’t recall that much being made of Major’s background in any positive way during his premiership (I had a vague idea that he came from a family of trapeze artists and circus performers) so it was good to see Major redressing the balance and making his father the central character of this book. Major’s father was 64 when the future Prime Minister was born and had lived a full life, being a reasonably well known Music Hall act with his first wife. Music Hall was a curiously British, incredibly popular form of entertainment, close to American vaudeville but not quite the same. The first wife had died as a result of a serious onstage injury after a steel girder hit her. The act was known as Drum and Major (which is where the surname came from as the family name was Ball). It was initially a baton-twirling, dance type act but as they evolved they introduced songs and sketches and became popular. 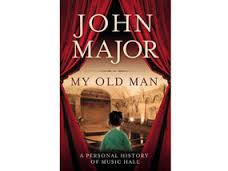 John Major here combines what is he knows of his father (realising that he hadn’t asked him that much when he was alive – the same old story) with a very readable general history of Music Hall and its stars. It feels very readable and written with insight and humour (it does occasionally stray off subject but the Music Halls are generally kept centre-stage). He is not always brilliant at citing references and lacks the comprehensive knowledge of say, Roy Hudd and even I spotted a howling mistake . It was Herman’s Hermits who had a hit with “I’m Henry the Eighth I Am” (extraordinarily an American Number 1 hit single) and not Manfred Mann, but that was a bit off subject, so I’ll forgive it and it’s probably been pointed out now a thousand times and may have even been corrected in editions later than my library copy. As a popular history of Music Hall, however, it would be hard to beat. It is a lost world he explores- recording technology was there at the latter stages but unable to capture these people at their best. 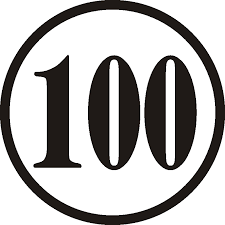 We may know the names of Marie Lloyd, Vesta Tilley, Harry Lauder, George Robey, Little Tich, Dan Leno and the like and we may know some of their songs but Major has done a good job at making these performers (and his own background) more accessible. If only he had been as competent at running the country.